Both cards were made from the one sheet of Art of Scraps Hearts Cut-Outs. The first card also uses Scrap-Ease Marble Gold Paper, White Cardstock, a Red Brad, Red Ladder Ribbon, Foam Tape or Pop Dots, Alphabet Stamps and Brown Ink. To begin, cut-out one large tag, one small tag, two squares and the title banner from your sheet of cut-outs. The large tag is your base. Wrap your ribbon around the tag, adhering it to the back to hold it in place. When adhering your tag to the marble background paper, centre it and angle it left to right. I prefer to cut the background paper to size as the last step as I it allows me to position the elements where I want and then trim away any excess background. This, however, is a matter of personal preference. You now want to attach your small tag. To do this, I glued it into the position I wanted. I lined up the little square at the top of the tag with the bottom corner of the yellow strip on the large tag. I then angled the tag in the opposite direction to the large tag to provide a sense of balance. When you are happy with your positioning, attach your brad. Make sure it is centred in the small square at the top of the small tag and passes through all the layers, including the background marble paper. Next, take your title banner and use your alphabet stamps and ink to stamp a word in the centre of the banner. As I was making a Father’s Day card, I chose to keep it simple and write ‘Dad.’ Of course, you can adapt this to any theme you like. Once the ink is dry, adhere your title to your card. When positioning it across your tag and background, keep it parallel to the bottom edge of your card. This will help draw attention to it. 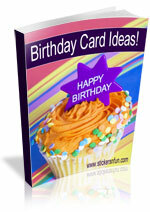 Now all that is left to do is to add an extra three-dimensional element to your card. 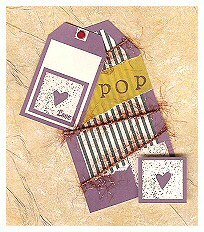 To do this, use foam tape or pop dots to adhere one of your squares on top of the heart square on your large tag. Instead of placing it directly on top, move it slightly to the right and angle it so the edges are parallel with the edges of your card. Take your second square and cut out the heart from the middle. Again, use your foam tape or pop dots to adhere, but this time, place it on top of the heart on your small tag. It is your choice whether you place it directly on top of the heart or whether you angle it, as I have done, to create the appearance of two hearts. Finally, trim your background paper to size (if you haven’t already) and adhere to the cover of a white card made from white cardstock. It is up to you whether or not you leave a white border around it or not. 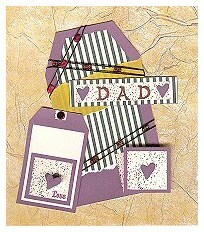 Either way, you have a great card for Dad, and you have enough of your cut-outs left to construct a second card like the one below. This card uses the remainder of your Art of Scraps Hearts Cut-outs, Scrap-Ease Marble Gold Paper, White Cardstock, a Red Brad, Rust Flash Fibre, Foam Tape or Pop Dots, Alphabet Stamps and Brown Ink. While this card is a variation on the previous design and uses much of the same principles and ideas, it is also unique in its own right and great to give to a father-in-law, grandfather or Pop (as in my case) this Father’s Day. Again, begin by cutting out the elements you need – one large tag, one small tag and one square. Once again, the large tag is your base. Wrap your Rust Flash Fibre around the tag, adhering it to the back to hold it in place. When adhering your tag to the marble background paper, centre it and angle it left to right. As before, the second step is to adhere your small tag to your card. This time however, place it so the centre of the square at the top of the small tag is directly above the centre of the top section of your large tag. Angle your tag out to the left, in the opposite direction to your large tag. I also tucked the bottom right-hand corner under the fibre wrapping the large tag. Once the small tag is in place, attach your brad. Make sure it is centred in the small square at the top of the small tag and passes through all the layers, including the background marble paper. This time, you do not have a title banner. Instead, use your alphabet stamps and ink to stamp a word across the yellow strip on your large tag. As I was making a Father’s Day card for my grandfather, I chose to keep it simple and write ‘Pop.’ Of course, you can adapt this to any theme you like. Make sure you give the ink enough time to dry. To add a little more dimension to your card, once again, use foam tape or pop dots to adhere one of your squares on top of the heart square on your large tag. Instead of placing it directly on top, move it slightly to the right and angle it so the edges are parallel with the edges of your card. Finally, trim your background paper to size (if you haven’t already) and adhere to the cover of a white card made from white cardstock. It is up to you whether or not you leave a white border around it or not. You now have two wonderful cards to give those special people in your life. I’d love to hear what you think of this Father’s Day card idea. Please leave a comment in the comments box below. This entry was posted on Tuesday, August 21st, 2012 at 8:58 pm	and is filed under Card Making, Family. You can follow any responses to this entry through the RSS 2.0 feed. You can leave a response, or trackback from your own site. to concentrate upon when running this business. It’s considered a surgical remodeling of the eye, or may also be cataract surgery. this temptation at least for the large part. About Houston Foot and Ankle Care: Owned and operated by Dr.
One of the causes of stress fractures is error in exercise,training or technique. Majority of the problems created are a result of high heels. used to view your site. Since all profitable businesses need to develop an effective plan for promoting and delivering their goods this is another area you need to consider. Working with prescription glasses I often hear lots of people. Eyeglasses – those fashion accessories that cover our eyes. Laser cryptolysis or resurfacing is also often advised. The third and final opportunity is the affiliate program. Business to business and business-to-customer requirements can be catered. locations like binders, files, walls and desks. if you are good at SEO content rich writing hire a professional SEO writer. I would act as the creative producer at a salary per episode. was forced to dye her dark hair blonde to fit the image of the American “good girl. Azcue and is based in Dallas, TX and launched December 10, 2005.